There is considerable debate about the value of applying calcium to Wisconsin soils used for forage production. Calcium is the dominant exchangeable cation in Wisconsin soils because it is held more tightly by the soil particles than most other cations including magnesium and potassium. Furthermore, the parent material for most Wisconsin soils contains more calcium than magnesium or potassium. Calcium is present in these soils as feldspar, amphibole, pyroxene, dolomite, calcite, apatite, and gypsum or on soil cation exchange sites at soil test levels of 500-5000 ppm or more. This exchangeable portion represents only a fraction of the total amount of Ca found in soils, which makes up about 3.6% of the earth’s crust. In Wisconsin, calcium deficiency for agronomic crops has been observed only on sandy soils with a pH of less than 5.0. Ground limestone used to correct soil acidity is the predominant source of applied calcium. The limestone quarried in Wisconsin commonly contains 300-400 pounds of calcium per ton of aglime. The amount of calcium added in limestone, plus the relatively large amounts of exchangeable Ca in the soil far exceeds the amount of calcium commonly removed by crops (50-100 lbs/a). 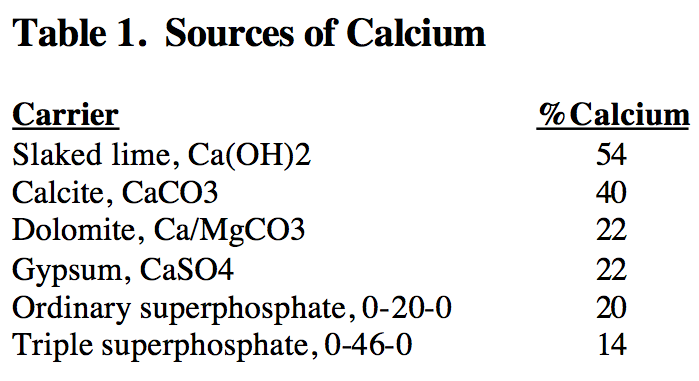 The amount of calcium in several liming and fertilizing materials is listed below in table 1. In recent years the use of gypsum as a calcium source has been strongly promoted. Beneficial uses of gypsum on soil improvement include reclamation of sodic soils, reducing limitations of subsoil acidity, increasing permeability of nonsodic highly weathered soils and as a source of both Ca and S. Deposits of gypsum are found in several states and in many other areas of the world. Gypsum is commonly used in wallboard and cement as well as a byproduct from the manufacture of phosphoric acid from rock phosphate (phosphogypsum). New technologies to improve air quality are resulting in a large pool of gypsum-based byproducts as well. The byproduct sources of gypsum tend to be finer-sized and contain more impurities. Particle size is very important in promoting the positive effects of applied gypsum to Na or acid-affected soils. In fact, many remediation effects have only been noted for phosphogypsum because of its greater solubility (10X) than typical mined gypsum. Some of the claims made in support of applying gypsum to soils used for forage production include enhancing crop yield and quality, improving soil physical properties, and altering the nutrient balance of the soil. Our response to these claims is provided below. Soils can become more acid or alkaline by use of acid or alkaline forming amendments such as aluminum sulfate, anhydrous ammonia or agricultural limestone. Even though most liming materials contain Ca, not all Ca containing amendments can neutralize soil acidity. The effectiveness of an amendment is determined by the anion present. In the case of dolomitic limestone (CaCO3.MgCO3) the carbonate is responsible. Sometimes gypsum (CaSO4) is thought to have the ability to change soil pH because it contains components often associated with materials that can cause pH change. However, gypsum is a neutral salt and has no substantial neutralizing or acidifying ability. Although exchangeable Al is a measure of soil reserve acidity, and has been related to plant growth, the Al saturation percentage has been shown to be a better indicator. Wisconsin soils tend to be low in Al saturation. Saline/sodic soils (soils high in salts/sodium) have extremely limited permeability. These soils are typically plastic and sticky when wet and cloddy and hard when dry. The exchangeable Na content exceeds 15% of the total CEC. These soils are also strongly alkaline, frequently pH 10 or higher. These conditions tend to develop from continued use of high Na, low Ca/Mg irrigation water. Limited water movement in sodic soils is a result of soil dispersion. These soils can be treated with gypsum or other Ca-containing amendments to reduce dispersion and restore friable conditions. Gypsum is widely used on the alkali soils of the Western United States, but these conditions are not typically found in Wisconsin. A considerable amount of research has been conducted in Wisconsin in the past 25+ years looking at the impact of varying the Ca:Mg ratio of soils on crop yield and quality. Despite the exhaustive research, there has not been any consistent evidence of improved crop performance as measured by yield or quality by increasing the soils Ca level relative to Mg. In some early work by Simson et al (1979) the Ca:Mg ratio of three different soils were varied by the addition of gypsum or Epsom salts. Although soil Ca:Mg varied more than five-fold, plant tissue Ca:Mg varied only from 0.8 to 1.8% in alfalfa and 0.44 to 1.06% in corn. The authors showed that movement of Ca and Mg to root surfaces in the transpiration stream was more than sufficient to meet crop needs. The plant excludes excess Ca and Mg at the root surface. They concluded that if soil pH is near neutral and sufficient quantities of K, Ca, and Mg are present, varying soil Ca:Mg ratio within the range of 0.8 to 5.0 will have no effect on alfalfa or corn yields. Other studies by Wisconsin researchers adjusted the Ca:Mg ratio of soils by adding up to 3200 lb Ca/acre as gypsum and 1924 lb Mg/acre as Epsom salts. Alfalfa yield and quality measured between 1991-1993 showed no significant correlation with soil test exchangeable Ca and Mg at any site in any year. Neither the initial nor annual applications of gypsum or Epsom salts had any significant effect on alfalfa stand, grassy weeds, or broadleaf weeds (Kelling et al, 1996a). Data from this study did not provide any convincing evidence that Ca:Mg ratios in Wisconsin soils are too low for quality alfalfa production. Potato yield and quality responses to applied calcium have been consistently seen in Wisconsin where soil test Ca levels have been below 300 ppm on sandy soils or 500 ppm on medium and heavier soils (Simmons and Kelling, 1987; McGuire and Kelman, 1984; Kleinberg, et. Al.,1999). Other crops where major storage organs are not in the water transpiration stream (eg. peanut, tomato, apples) can also show Ca shortages. Yield responses have been noted for many crops grown on highly weathered Oxisols and Ultisols in Georgia, Brazil, and South Africa. However, these soils are very different from those found in Wisconsin and relatively high rates of very-finely ground gypsum were needed and crops did not respond until the second season. Research has also been conducted in Wisconsin to look at the effects of various Ca additions on soil physical properties (Kelling, et. al., 1996a). Earthworms near the soil surface at each site were counted after adding an irritant (pyrethrum) that induced individuals contacted by the solution to come to the surface. Differences between Ca and Mg treatments were not significant at any site. The only soil factors significantly correlated with earthworm counts were organic matter and available P in the Withee silt loam soil. Root penetration, aeration, and water infiltration are hampered by soil compaction. Soil compaction in the Withee soil was measured by recording the resistance of a cone of known diameter when forced into the soil electronically at a constant rate. There were no significant differences between Mg-treated and control plots in this study. Research comparing alternative fertility programs conducted at the UW Agricultural Research Station at Arlington over a six-year period from 1990-1995 did not show any significant effect of applied Ca on soil physical properties (Kelling et al, 1996b). Results of the annual penetrometer measurements made during the study, showed some plot-to-plot and year-to-year variation, but nothing that could consistently be attributed to treatments. The impact of the preplant application of crushed wallboard and gypsum on alfalfa yield, soil test levels and tissue nutrient content were monitored in a Wisconsin study (Wolkowski, 2000). In the first year of the study, soil pH decreased slightly, soil Ca and S increased, and soil test Mg decreased where wallboard was applied. The effect on pH was likely a result of the large quantity of applied Ca displacing acidity from the soils exchange sites resulting in a greater measured level of active acidity. This “salt” effect is thought to increase Ca mobility to subsoil in very acid soils. As was observed in the first year of the study, soil tests taken in the third year indicated that the soil pH decreased slightly, soil Ca and S increased, and soil test Mg decreased where gypsiferous wallboard was applied. Increases in forage nutrient concentration were consistent with treatment applications. The decision on whether it is advisable to apply Ca to soils where forage crops are to be grown should be based on several factors. 1. Is available Ca below the optimum soil test level? In Wisconsin, when forages are grown, the levels of soil test exchangeable Ca are often quite high. These soils are either naturally high in pH or limed. The naturally high pH soils are derived from calcareous parent material and, therefore, naturally high in Ca. Soils which have been limed normally have adequate levels of Ca, as Ca is a common component of liming materials. In cases where the forage to be grown is a legume such as alfalfa, these soils must be limed for optimum production. 2. Is the subsoil acidic? Many of the soils of Wisconsin are derived from acid parent material. Soils having pH < 4.5 to 5.0 are considered strongly acidic and can contain phytotoxic levels of soluble, exchangeable Al and sometimes Mn. Use of finely divided phosphogypsum may help overcome this limitation, but economics of doing so are questionable. 3. Is the soil saline or sodic? If the soil has a relatively high level of Na present in the plow layer, the addition of gypsum has been shown to be beneficial to improving the soils physical condition. Most naturally occurring high Na soils are found in the lower rainfall areas of the western states. Occasionally we may find a soil in Wisconsin, which has received excessive amounts of Na from byproduct materials such as dairy processing plant wastewater. A more soluble gypsum like phosphogypsum may be of benefit if surface sealing or crusting limits stand establishment or water infiltration. It is clear that research has shown that calcium additions can be a benefit under specialized situations in certain parts of the world. It is rare, however, when these conditions exist in Wisconsin soils. We continue to recommend that Wisconsin soils be limed to the optimal pH range using the most cost effective liming material available. Furthermore, no research has surfaced which suggests that our soils are out of balance with respect to Ca:Mg ratios and that we should be adding calcium for this purpose. Kelling, K. A., D. E. Hero, J. D. Doll, and R. P. Wolkowski. 1996b. Effectiveness of an “alternative” fertility program. Proc. of Wisconsin Fertilizer, Aglime and Pest Management Conf. 35:183-198. Kleinberg, M. D., J. P. Palta, C. C. Gunter, and K. A. Kelling. 1999. Impact of source and timing of calcium and nitrogen applications on Atlantic potato tuber calcium concentrations and internal quality. Jour. American Society Hort. Sci. 124(5) 498-506. McGuire, R. G., and A. Kelman. 1984. Reduced severity of Erwinia soft rot in potato tubers with increased calcium content. Phytopathology 74:1250-1256. Peters, J. B., K. A. Kelling, S. M. Combs and R. P. Wolkowski. 1997. Should Ca be added to Wisconsin forage soils. New Horizons in Soil Science, No. 4. Department of Soil Science, University of Wisconsin- Madison, Madison, WI. Simmons, K. E. and K. A. Kelling. 1987. Potato responses to calcium application on several soil types. American Potato Journal 64:119-136. Simson, C. R., R. B. Corey, and M. E. Sumner. 1979. Effect of varying Ca:Mg ratios on yield and composition of corn (Zea mays) and alfalfa (Medicago sativa). Commun. Soil Sci. and Plant Analysis 10:153-162. Wolkowski, R. P. 2000. Land application of crushed gypsum wallboard waste for alfalfa. Commun. Soil Sci. and Plant Analysis 31:187-199.